At their June 14 regular meeting, Acme Council decided to hold the citizen requested town meeting on Wednesday, July 14. It will be held at the Acme Hall with a two hour time limit from 7:00 p.m. to 9:00 p.m. Questions for Council should be handed into the office by July 5. There will be no open mic. The request came about because a group of citizens have questions for all of Council. Council asked Administration to locate somebody neutral, to act as mediator. The Village of Linden's coulee has received a very professional make-over. On Tuesday, June 22 the Encana Corporation brought about 34 employees who were joined by Linden residents, Village staff, park caretakers, and local firemen for a day of "Coulee Park Spruce Up and BBQ". Olds/Didsbury/Three Hills MLA Richard Marz presents Kneehill Ambulance Director of Operations Ed Guenette and Deputy Operations Director Garry Cunningham with a $10,329.82 Community Spirit Grant. The funds have been put toward Defibulation units for each ambulance. Each unit costs about $27,000. 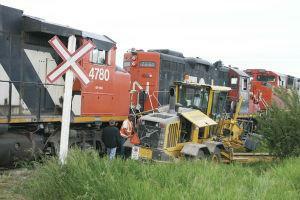 A Kneehill County road grader operator escaped serious injury when he collided with a CN Train on Tuesday morning, June 28. RCMP at the scene made the call for emergency services to be dispatched. At around 6:30 am, Linden Fire and Rescue and Kneehill Ambulance were dispatched to an area just south of the hamlet of Swalwell, on Township Road 30-0 and Range Road 24-3.